I had a really dumb moment while reading this book...You know this reminds me more of West Side Story then Romeo and Juliet….wait, my brain catches up. Right West Side Story is based on Romeo and Juliet. Ha ha. To be honest with you I’m not the biggest fan of Romeo and Juliet. I enjoy Shakespeare’s comedies much more but for some reason I’m drawn to the retellings of the story. 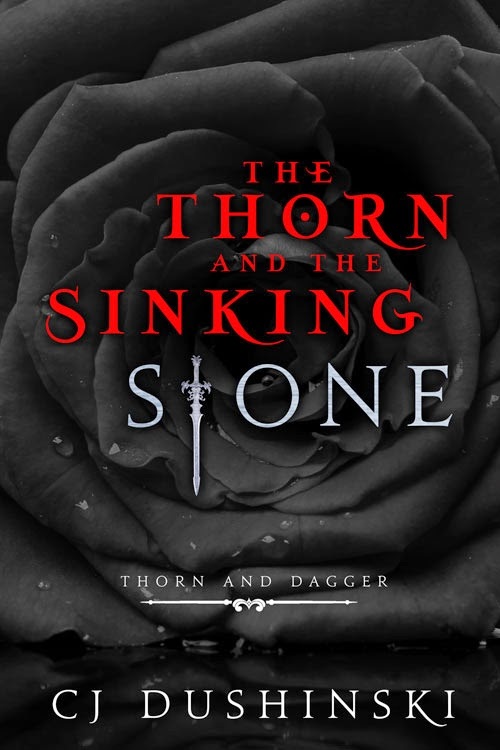 The Thorn and the Sinking Stone intrigued me because of Valencia’s curse. I liked how even though it had the basics it really takes it in a completely different direction. I really liked the plot, it takes the star-crossed lover bit and keeps that in tact but really spins some other things. Rain City is definitely a scary and strange place. In my head I kept picturing everything gray and the characters in color. I don’t know if that explains how things unfolded in my mind. At first when I started reading I was a little confused by the gangs. I think it was more of their names that mixed me up. There are the Black Roses (Thorns), The Daggers (Irishmen), The Boatmen and the Cowboys. Since they sometimes called them by two different things it would confuse me. Then there is the law which are the Watchmen. I liked how they were kind of a common enemy amongst the gangs. It was also interesting to get a glimpse into how the two different gangs are raised and how things get twisted by vengeance. The gangs are one part of it but it also really digs into the Cursed and how being one of them can make you public enemy number one. I loved Sebastian, I definitely kept swooning over him. Such a mellow and reasonable guy. I liked how he always has this peace and calm over him. He is a little bit on the brooding side but how much he cares about his family really shines through. Valencia is tough, distrustful and a bit confused. She thinks she knows where she fits in but finds out she really doesn’t. Where Bast is more sure of things Valencia is more hesitant. It made them compliment each other well. I loved the Daggers family bond of Kane, Sebastian and Callan. Plus they had their Uncle Corduroy and the Bowler Hat. Who would pretty much do anything for them. Such a solid unit in such a weird world. Very unlike Valencia’s upbringing who has a mother who acts like she despises her and a brother who is a bit on the crazy side. Great ending. I liked everything about it. It leaves you satisfied but there is room for companion novel.